The ideal vision of fall: bright days that grow cool and call for warm knits as we walk under leaves that curl red and gold in a soft wind. As friends come together to mark the end of summer and anticipate coming festivities, there is one warm treat that has come to stand above all others – one that we get asked for again and again and again because people love it so much. 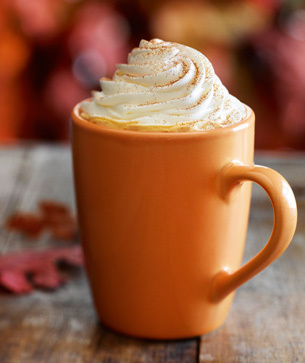 The Pumpkin Spice Latte is fall’s favorite drink. Signature espresso blended with the unmistakable spices of fall – cinnamon, nutmeg and clove – smooth with steamed milk and topped with delectably sweetened whipped cream. When it's time to fall back into fall, sweet and spicy pumpkin is sure to please. When you're feeling tired and sluggish, there's nothing like picking up a warm cup of energy with this little guy smiling back at you to perk you right up. Do any of you know how to make your own coffee art, or have you gotten any cute or unusual designs in your drinks lately? Tell me all about it in the comments below.